So here is my giveaway. This is a complete kit from Lanarte. This giveaway is only for our HAED blog members and you have to post at least once your progress in June. We will pick a winner on the 1st of July. So if you would love to win this kit, please leave a comment on this post. Well technically my DD Jennifer's progress as I didn't stitch on my HAED's! Hi Everyone! I've been busy lately, but I've been reading all the posts and all the work is beautiful! I don't comment often, but I read everyday! Kudos to you all!!! What a talented bunch! One of my yearly goals this year is to finish page 11 of this darling, and I'm so close! I plan to continue on at least until it's finished. 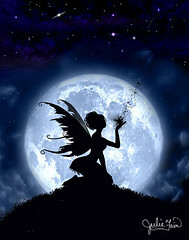 I also need to get moving on the freebie Story Keep, I chose Moon Fantasy. I haven't even pulled the floss for her yet! If you are interested in what's been keeping me so busy lately, and you haven't heard the 'saga', check out my blog. Sorry I've not posted since the end of last month. Things here are just so chaotic and stitching time is very limited. 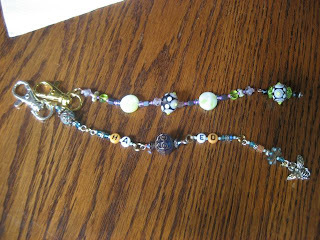 I'm not able to stitch everyday or even every few days some weeks, and my own blog is suffering from a lack of updates. 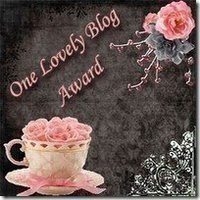 I understand that this blog is intended for everyone to post each week with their updates but I'm finding it impossible to manage that, so if Cindy & Wendy feel that my place on the blog would be better taken by someone who can post more regularly then I totally understand, although I would love to stay if that's ok. Anyway, I do have a couple of updates. I've mainly been working on my Alisha QS for the last few weeks, not done a lot compared to some of you speedy stitchers, but I'm really happy with how she's looking and I've loving stitching with these gorgeous colours. I also made a start on the freebie Storykeep SAL on the HAED BB when that began earlier in the month. As you can see I only managed a tiny amount, but it's a start. I love coming on here and seeing all the gorgeous updates. I do feel sad sometimes that I'm not as quick a stitcher as some and don't make as much progress, but I keep telling myself it's my hobby and I just need to slow down and enjoy the process. I'm finally able to post my progress too this week. It has been very busy for us the latest weeks, lots of new products came into our store and we had an open house last week. But our kids have almost their big schoolvacation (still 1,5 day school). Their vacation start here on the 1st of July and this for 2 months. I hope it won't be that stressy anymore and I will be able to do a lot of creative things. In the meantime I kept watching all of your wonderful progresses and I love them all. But I didn't have the time to comment on them. You guys are doing a wonderful job. So here is my progress from the last 2 weeks. Yeah ! I finished my 3rd page. 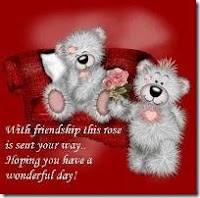 Wishing you all a wonderful weekend with lots of stitching fun. Keep up the good work. Here's my progress on TT Purple Dragon. This was nearly a disaster as I subbed the metallic onb her face for DMC 3865 and it was way too light and looked awful. I started to unpick it but caught the fabric and pulled it. I was so upset as I didn't want to ruin it and have to restart. Anyway I think I've saved it but instead of unpicking I've had to stitch over the 3865 so it's a little bulky but I think it'll be OK. I finished the first vertical row of The wizard of Oz! It has become beautiful, it's nice to see a complete piece of the picture already. I started at the top again, that's page 2 officially. A lot of confetti stitches again, but that's part of the job, it's the reason why this is so beautiful. I've just looked through all the posts for this month. My goodness you are all moving along so fast. Some of you are phenominal! You can sure tell I am the slow stitcher in this group! 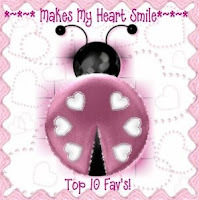 I love to see your progress thank you so much for your sharing and encouragement. I haven't stitched on my large piece this month at all but I did get some done on the storykeep Thursday. (I forgot about posting, sorry.) Here is before and after. I think I got about 200 stitches and I absolutely know that every single hole left behind is filled this time. If there is another hole in there it's going to stay at this point. Well I haven't had the most time to stitch this past week since the OH and I are sharing one car to get to work and most mornings we have been getting up at 3am which makes me unbearably tired in the evenings. 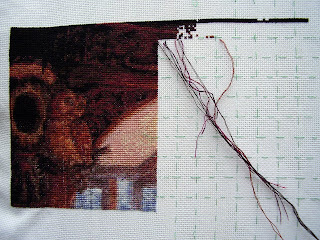 I did get some stitching in last weekend and a little last night but still haven't finished page 1. I only have 19 more rows of the dark navy blue to go and then need to fill in the stars and then it's on to page 2. Honestly! Where does the week go?!! ...lol...I was cleaning house and having the best time...NOT!!! and it hit me...it's Thursday! We're already seeing some amazing progress! Good job ladies!! Hi Everyone! I had been stitching on my Sleeping Beauty for the past 1 week, taking it slow and steady. This is the progress since 7.30am this morning. I didn't had the time to iron her before taking a picture as I was rushing to make some buns for coffee. I hope that you will enjoy looking at my work ! You all are cheering me up, as always. Ok. .now I'm in big trouble! 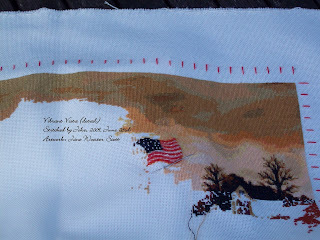 I can't add hours to the day to fit in more stitching time, and I get the newsletter from Michele, with new artists listed. And anyone who loves detailed Santas, Dragons & Merlin, is going to love Miles Pinkney. Go take a peek! And I know that I'm going to have to stitch a N.A. piece for my hubs. .Michele Zarb is extraordinary! I hope that everyone is staying cool, and has a beautiful evening! Hello ladys.... I stitched a lot in these past two weeks. I finished one page and I am on half with the next page. Her face comes closer and closer. !!! Also I see a lot of beautiful designs. Everybody is doing a great job !!!! Keep up the good work everybody !!! love you all !!! Here is my update. The tower grows slowly. When I get bored all that confetti stitching, I stitch mountains. Seeing everyone's progress is really motivating for me- thank you! 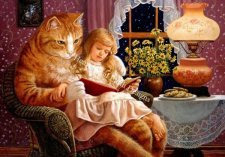 hello everyone, I am for the moment very busy, but still a little further response to snow white! I see so many beautiful things pass, beautiful designs and patterns, you all do wonderful work! Last week I stitched on 'Impossible love' all the time and I finished the first page! It's unbelievable how much quicker this pieces stitches compared to 'The wizard of Oz', but there are much more stitches of the same colour next to each other. In the lighter parts there's a lot of Kreinik, so there's a sparkle in it, but you can't see it in the photo. Imagine the stitching is much more beautiful in real life! 'The wizard of Oz' is doing fine, I almost finished the first top-bottum row (2,5 pages) en after that I will post a photo again. I think I must manage it this week. Vibrant Vista has a real American flag now. I changed it a little bit, because while stitching and using the colours as charted, I noticed the stars weren't visible. And how about an American flag with only stripes? No way, although I am not an American woman, that just isn't done! So I added some white stars and here she is: The well-known Stars & Stripes! I have to admit I have been thinking about changing it into a Dutch flag, but then I considered the artwork isn't Dutch at all and I may encounter some big difficulties changing the colours, so why change it if it is not for the better? My stitching is staring at me! I've been enjoying my break from university for five weeks - I've been free for two now. I'm also feeling a lot less sick now that I've got a new doctor and new treatment which is helping a lot and giving me more energy. With all that free time and energy, what do you do? I stitched! 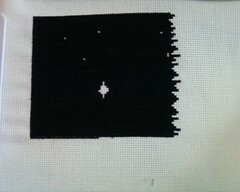 :) So here's Dark Cherry with 80x155 stitches complete, about 38% complete. Sorry for the blurry photo - my camera didn't seem to want to cooperate! She's stitched 1x1 in DMC and Petite Treasure Braid for the sparkles, on 32ct white jobelan. I love her eyes, they're softer in the stitching than in the picture, or the web version anyway. 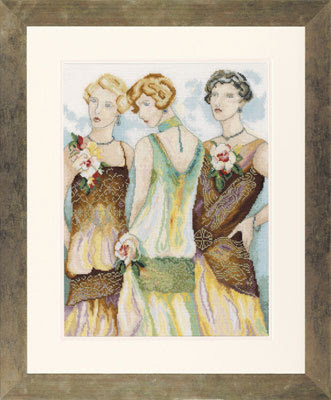 I love stitching Ching-Chou's pieces, they have such lovely colours and faces. The flowers are lovely too even if they are horibbly confetti-ish, that bottom one on the left is quite sparkly IRL! I HAVE been stitching! This pic is terrible and looks like I have a lot of fabric showing through....it doesn't look this bad in person...lol....(ok, maybe I want to believe it doesn't) I took the pic under a very bright light and set the camera to macro.....maybe I should take it from 10 ft. back;) Wonder how many years it will take me to catch up with Diane?? Hers is gorgeous!!! It's been a long while since I've posted on this project but I have actually managed to get a little more done. The weather has been so lovely here lately that I hardly done any stitching over the last few weeks but if you want to take a look at my other projects have a look here http://totallythreadup.wordpress.com/. Here are the before and after pics for you. It doesn't look a lot but I'm stitching this on 25 count so it's quite difficult but I am determined to carry on with this and try and make significant progress over the next few weeks. I'm also working on QS White Cat and when I went to stitch on this recently I discovered that I had made an A3 working copy of page 1 but then folded this in half and did a further A3 copy so whereas I thought I had completed one page I've only actually done a half a page! It's a QS so I've completed 1/6th of the chart so I must make some time to do some more on this. It's Thursday and everyone who is able to stitch, we can't wait to see your progress! Wendy and I were chatting earlier today and we were worried our members may feel pressured to post every week. We don't want anyone to feel this way. I'm going to put a survey at the very bottom of this page asking you how often you want to post or if you want to continue a Thursday SAL. (Just hit your END tab on your keyboard and you'll get to the bottom quicker:) This is your blog, so we hope you'll participate. Please don't be afraid to post suggestions or email Wendy or myself with questions. Babs had suggested we have the Archives listed on the sidebar, which is a great idea. Anything else you'd like to see, not see? 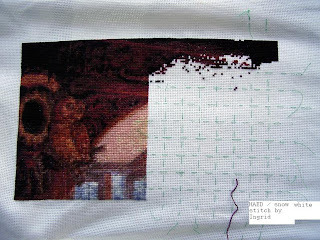 Here's a picture of nearly 3K stitches of Ciro Marchetti's "Bubble Telescope." I'll be stitching the top 300 stitches across the entire piece so I don't burn myself out on light blue. Not to mention that I can't wait to see the gammit of color across the top of the piece. In case you're interested, here is what the entire piece looks like. I finally got the fabric I ordered for my new start - "Fragile" and I am anxiously off to start it! I practiced yesterday stitching one over one on 25 count Lugana (using one strand of floss). I have to use a magnifier (it attaches to my glasses) to see the holes. 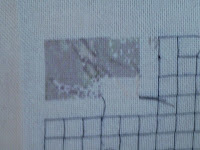 I also tried stitching on 18 count fabric (using two strands of floss) and I found that to be a tad easier. I am wondering if anyone has tried stitching on the pre-gridded 22 count fabric (came across this fabric while browsing cross stitch sites). 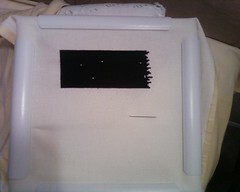 Any suggestions on stitching one over one and cross stitch fabrics would be greatly apprectiated. Thank you in advance!! 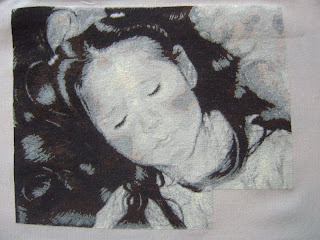 She is an experiment in combining tenting with X-stitches and is done 1 over 1 on 32 ct Lugana (Burnt Papyrus - SMF) I started her in Feb. of 2006 and completed here May 2009. This was one of my swips... most of her was done in 2008 when she became a focus piece. She is now framed and hanging up on the wall. And I have a weird problem. No matter from what angle I look at it. I do see a line between page one and two. Asked my husband, and he does see that too. I never had that before. Does anyone know how to get rid of that line? I am loving summer break. I was able to put in about 1300 stitches on my AWH this past Friday. 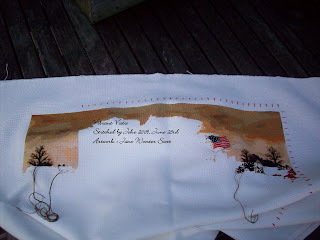 I am happy to say the sky looks wonderful however the next time I post...I will be stitching on another tree!! Yep...you got that right....another tree is coming up!! I am not looking forward to that I must say but I am loving the colors. This has been a busy month for me and thinking back i wonder if i slept... my husband is of the opinion that I have not... grin. I am tired and will take a break for a few days but there is a picture that I have been holding back... yup a finish! 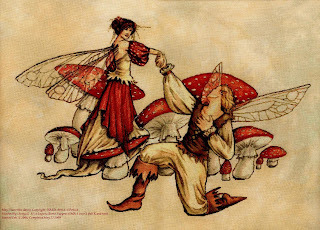 I will show that to you all on the 24th... for Fairy Day. First there are some wips where I have completed the first page : Heart of the world : & also Claire's wings. I attempted to start my first-ever rotation this month. I was planning to stitch Jolly Old Fellow half the week, and L&L's angel of Hope on the other half of the week. I just can't do it. Once I started the Angel I started to obsess about finishing her so she could be part of my Christmas decorating this year, recognising that even if I stitched every waking moment for the rest of the year Jolly Old Fellow would still not be finished in time for this Christmas. 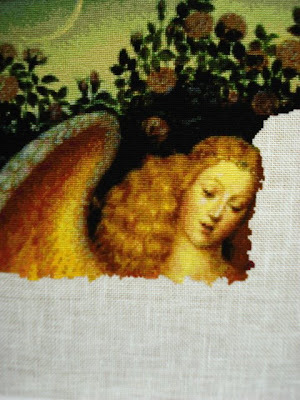 Also, I had some difficulty adjusting to stitching on the larger-count fabric, so I decided to bite the bullet and work on the Angel till she's finished - which will be all this month, and probably at least the first 2 weeks in July. I'm expecting her to be at the framer well before the end of July. So, JOF is now officially a UFO ( my first ever in 20+ years of stitching! ), and I won't be stitching on him for the next month or so. But as soon as Angel of Hope is finished, I'll be back stitching on JOF, so I would like to remain a member of this group. I really do enjoy watcjong all the lovely HAED projects growing. 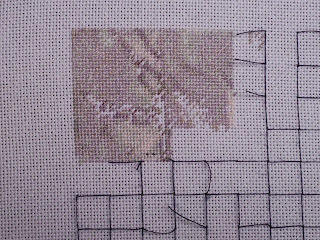 It's being done on 18ct aida with 3 strands over 1 and full crosses. 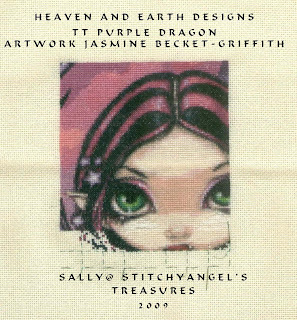 What's really cool is on my flickr page, Julie Fain actually left me a message that she was following my stitching and she hadn't actually seen any of her art done in a cross stitch yet so that was very cool! Anyways, thank you all for letting me join and I look forward to seeing all of your lovely HAED's! 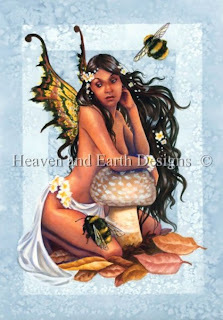 I decided to restart my Presence of Gaia on 18 ct. Aida. I love this design so much and I just have to stitch it. But to keep on stitching on evenweave would keep me stitching another 20 years. So I hope working on Aida will be easier for me. 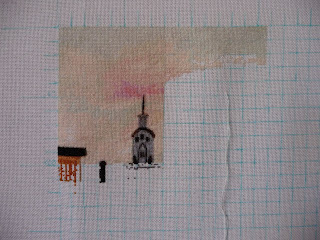 I haven't stitched that much yet, so it is the right time to restart. I will be in Berlin next week on business, so I probably won't be able to start until the beginning of July. Ladies, I do love your works and your progress pictures are awesome. I sure hope that I will be able to show some real progress after the restart. It has been a while since I have I posted here, sorry everyone. But even though I haven't posted, I have been participating the the Thursday SAL. So here are my before and after pictures of Gypsy Rose. This blog is so inspiring and I just love seeing all of the projects that you are working on. I don't comment very often on other posts but I do read all of them. Keep up the great work everyone. It's me and the wizard again! Caroline is our lucky winner for May 2009!! !